Jonathan Creek star Alan Davies and actress girlfriend Julia Sawalha are taking legal action over reports they have secretly wed. The couple have denied suggestions they are even engaged. Through lawyers, Davies and Sawalha, who stars in Absolutely Fabulous, said they wanted their families to know the rumours were false. They added that action was being taken against newspapers that had printed "totally inaccurate stories". 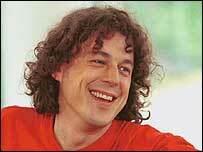 The statement said: "Alan Davies and Julia Sawalha do not discuss their private lives in the media. "However, they would wish their family, friends and others to know that, contrary to recent reports in a number of newspapers, they are neither married nor engaged." Davies, 37, started out as a stand-up comedian before landing the role in Jonathan Creek, where he met Sawalha. His other TV roles include Many a Splintered Thing and Bob and Rose. Sawalha, 35, has appeared in many TV shows since making her debut in children's drama Press Gang in 1989. But it is her role as the downtrodden Saffy in Absolutely Fabulous for which she is now most famous.